Hamsters are popular pets, and understanding their needs can help all new hamster owners provide the best possible care for these charismatic critters to lead a happy, healthy life. Lifespan: A typical hamster lives just 2-3 years. Understanding that lifespan is critical so you don't feel guilty if your hamster does not live to the ripe old age a cat or dog may reach – a three-year-old hamster is, after all, senior citizen. Nocturnal Lifestyle: All hamsters are most active at night with digging, burrowing, chewing, scurrying, and other activities, which can be disturbing for light sleeping hamster owners. This can easily be overcome, however, by positioning a hamster's cage away from a bedroom. Nipping and Biting: Even the friendliest hamster can nip or bite when it is annoyed or disturbed. This can often happen when the hamster is woken up during the day, or if it is startled or handled roughly. Because of this, hamsters are not always the best pets for young children, though they can be perfect for introducing older children to pet ownership. Once you decide a hamster is right for you, it is important to be able to meet the hamster's needs. Cage: A hamster's cage should be sturdy with plenty of space to explore. Wire cages should either be covered with a fine mesh or have bars no greater than a half-inch apart; hamsters can be great escape artists. A large aquarium with a mesh top is ideal for hamsters and minimizes the chances of escape. Floor Covering: Hamsters love to burrow, and loose bedding on the cage bottom will help satisfy that urge as well as absorb water spills, urine, and feces for easy cleaning. A layer 2-3 inches deep is best, and bedding options such as hay, shredded paper, and pellets are all suitable. Cage Placement: The best place for a hamster's cage is in an area free of direct sunlight (which could overheat your hamster) as well as away from drafts. 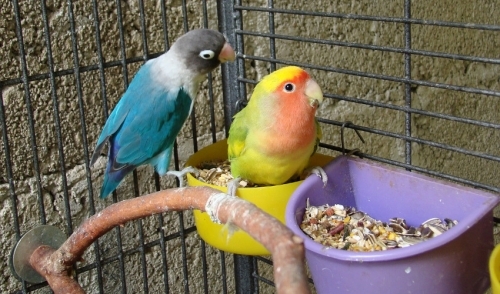 Do not position the cage near heating or cooling vents, exterior doors, radiators, or windows. 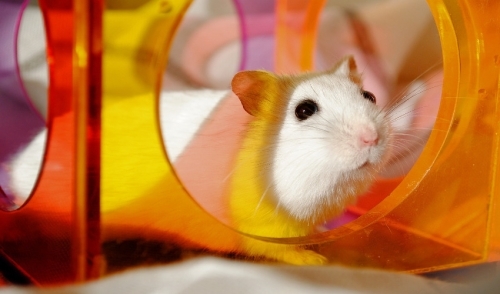 Exercise: Hamsters require abundant exercise to stay fit and healthy. A hamster wheel is a must, but should be removable for easy cleaning and to keep the hamster from getting bored. Ramps, ladders, and tubes in the cage will also provide good exercise. Even simple tubes such as empty toilet paper or paper towel tubes are ideal. Security: Hamsters can be shy and will appreciate a safe, secure place to sleep. A cozy nook can be created in the cage with an inverted bowl with a door cut out of it, or an empty tissue box will suffice. Provide a paper towel or old, clean rag for the hamster to chew up for nesting material. Food: Hamster feed is often sold as a seed mix or concentrated pellets. Supplementing that diet with fresh fruit and vegetables will keep the hamster healthy, but avoid providing too much food that could be stored (these pets love to hide extra food). Favorite treats include chunks of apple, carrots, bananas, and cucumbers, as well as lettuce, kale, or other greens. Water: A fresh, clean supply of water is essential for your hamster. Inverted bottles that attach to the cage are best and can be easily cleaned and refilled daily. Chewing: As rodents, hamsters' teeth are constantly growing and they need to chew on tough materials to keep their teeth in good condition. A piece of wood, dog biscuit, or special chew toys will help with their dental care. Handling: If you want to pet, hold, and handle your hamster, start by feeding it treats from your hand and gradually work up to holding it gently for several minutes at a time. As your hamster grows accustomed to you, it won't mind being held, and socializing your pet will help keep it from getting nervous and stressed. Veterinary Care: Know which local vets are experienced with hamster health, and watch your pet carefully for signs of illness such as bald patches, breathing difficulties, weight loss, shaking, or diarrhea. If your hamster seems sick, get it to the vet immediately. Annual checkups are also a great idea to keep your hamster fit. Hamsters can make great pets for all ages, if pet owners are familiar with hamsters' needs and ready to make their home hamster-friendly.